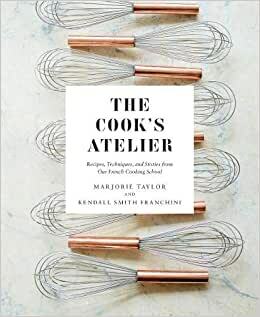 Start reading The Cook's Atelier on your Kindle in under a minute. "A welcoming 400-page beauty filled with evocative photographs and approachable recipes, it's a volume you'll revisit time and again." 1.0 out of 5 starsAre You Looking For A Beautiful Book? Or a more intense recipe experience? As someone who owns more than 200 Cookbooks and purchased this one after reading the reviews here I find that this one doesn't come close to matching the rave reviews. It is a beautiful book with gorgeous, abundant photographs. But I would categorize this as a coffee table book with recipes rather than a book for cooks who want to add to their recipe repertoire. In fact, I realize I should have been wary of any book with 100% 5-star reviews and was going to return this book (the first cookbook I ever intended to return,) however, the $8.96 return fee discouraged me. I would caution a potential buyer to perhaps look at this book IRL before making a purchase. I am so excited to finally receive this book. I’ve been waiting for this for a while, because I had the amazing pleasure and experience to cook with Marjorie and Kendall a few years ago. Frame of reference about me: I am a self-taught cook since 1997. However, I had always wanted to take an extended course, at least a week in France as that is the area of cooking with which I am most familiar. After a lot of research, I chose Marjorie’s course in Burgundy. Marjorie comes with an impressive culinary history. What particularly interested my was that she studied at La Varenne under Anne Willan. I chose to take a 5 day course with my brother. Kendall’s knowledge of Bourgogne wines and cheeses is extremely impressive. We spent about 6-8 hours each day, cooking, talking, and learning. Because they are so careful to choose products that reflect what is in in season, you only get to cook a portion of their recipe catalogue when you work with them in Beaune. With this book, I now get a whole collection of the recipes, beyond what we were able to make during the week with them. She trained with some of the best, and it’s reflected in the recipes. Also, because she works so closely with local producers and artisans, she has all their knowledge at her disposal. This is an outstanding book from an outstanding chef, and the only thing that could be better would be to go back to make more of the recipes with her. I was delighted to hear Marjorie was coming out with a cookbook. I was able to take a class with her in Beaune. We met at the market place in the city's main square to shop for provisions and then spent the day cooking a most delicious memorable meal, with wine of course. What an experience. Her cookbook arrived today and I can't put it down. The photographs are beautiful and inspiring. Her story of how she began and introductions to some of her favorite food purveyors are a joy to read. The recipes not complicated and easy for any level cook. I can't decide which one to start with. What a wonderful book this is, a labor of love for sure, it's gorgeous and takes you beyond the authors' atelier. Anson Smart's photos really capture their beautiful world in Beaune, one of the prettiest spots in France. Their recipes are written with care and what surprised me was their unique concept for chapters. You expect seasonal cooking in French cookbooks, but their particular subchapters put you in the center of their lifestyle, like Jam Day, Dinner in the Wine Shop, Beaujolais Nouveau, Fireside Cooking. I unpacked my book this morning, finding the back cover photo facing me: two copper molds with souffles popping up, held by cooks in floury white aprons - I was hooked. You will be too. I was very diappointed in this book. The story was short and seemed trite-certainly not like a David Lebowitz book, or even Julia Child, as far as recipes/techniques. The photography was beautiful, perhaps that was what this book should have been billed as, with the recipes and techniques of secondary importance.